So Many Gadgets! What Do We Choose? As I read the article about the new Kindle upgrades coming up in October, I started to feel really overwhelmed. There is so much to choose from these days. So, I thought I’d break it down a bit. It is all a matter of what type of operating system you prefer (Android or Apple iOS) and what uses you have for your devices. The Amazon Kindle has been out since 2007 and has evolved a great deal over the last four years to compete with the growing e-reader market: Nook, Kobo, Sony, and most recently, Google’s iriver Story. It has been interesting to watch how obvious the competition is which all of the companies dropping prices and mocking each others’ style. Note the latest touchscreen craze. Then we have the NookColor, a mixed tablet and e-reader that has succeeded in knocking the Kindle off of it its pedestal. In terms of e-readers, to me, the Kindle wins hands down. I’ve really enjoyed my Kindle and am looking forward to a new touchscreen version. Amazon has excellent customer service, and shows no sign of crashing and burning anytime soon, unlike Barnes & Noble and Borders. If prices keep dropping the way they have, they’ll be pretty cheap here soon. Now, if only we can stop the rising e-book prices. But, library lending and all of the free and reduced priced e-books available out there might just take care of that. The iPad wins here. I am not an Apple fiend by any means, but like the Kindle, the iPad has been around for over a year and offers a lot of different apps for various purposes. I use mine as a laptop basically. I also love that I can enlarge the text so easily. Give me a year and I might be saying something different, but for now, I go for the iPad. Other tablets to watch: Acer Iconia, Samsung Galaxy Tab, and of course the Kindle Tablet. Why have a tablet AND an e-reader? I don’t think of my Kindle as a computer. iBooks does not have nearly the book collection that Amazon does, and reading on the iPad Kindle app does not feel the same. I can still curl up with the Kindle in bed or on the couch, and it isn’t hard on the eyes. I love how both Kindle and iPad can fit easily into a tote bag. 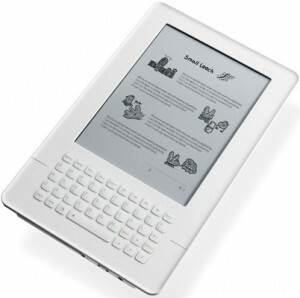 Plus, e-readers are getting to be cheap enough that it wouldn’t be a huge setback to have both. And then there are smartphones…but that market is a whole niche of its own. iRiver is known for making great portable DAPs and PMPs. 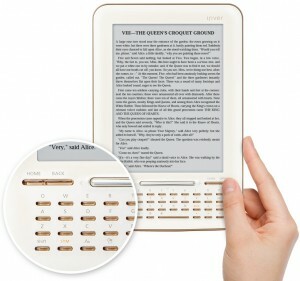 So everyone got somewhat curios when they entered the eBook reader market. Their sole reader — the iRiver Story has been out of reach for most of the west because it has not been selling anywhere in the US. That has not changed but it has gotten some hands on time at The Register. The Story actually does look like a distant Kindle cousin but the reviewer assures us that it is only skin deep. It looks similar on the outside because it has a full QWERTY keypad and the same white color. But that is where the similarities end. The keypad actually encapsulates all the main controls on the device. As was apparent from the images, all the main controls sit above the keys and four directional keys are integrated within the keypad. So at a glance it might seem like it has dedicated controls missing. The well integrated set up makes for a really nice façade if nothing else. The keypad looks really nice and it apparently is very comfortable too. It supports PDFs, EPUBS and a host of other formats that include office files like word, powerpoint, excel, etc. That is nice and impressive. But if you want to have full functionality, you will have to upgrade to the latest firmware. A main area where it loses out to the Kindle is the lack of built-in wireless. This means you will be tied down each time you want to do something online. Plus the bookmarking system is a slightly complicated series of button presses. One great thing about the menu system is that it thankfully bypasses tedious page refreshes every time to access a sub-menu or a new one. Overall, it is a good eBook reader though.